This data set provides the distribution of thermokarst landscapes in the boreal and tundra ecoregions within the northern circumpolar permafrost zones. This dataset provides an areal estimate of wetland, lake, and hillslope thermokarst landscapes as of 2015. Estimates of soil organic carbon (SOC) content associated with thermokarst and non-thermokarst landscapes were based on available circumpolar 0 to 3 meter SOC storage data. A spatial modelling framework was used to estimate where thermokarst landscapes are currently located or could develop.The framework weighed the perceived relative influence of landscape characteristics including ground ice content, sedimentary overburden thickness, permafrost zonation, terrestrial ecoregion, topographical roughness, and the presence of permafrost peat soils (histels). Weights of landscape characteristics for determining the regional coverage were decided through an expert elicitation, which included input from all co-authors as well as from members of the Permafrost Carbon Network. Estimates of SOC storage for the three thermokarst landscape types, and non-thermokarst landscapes,were based on available spatial information of 0-3 m SOC storage from Hugelius et al., (2014). Partitioning of the total SOC storage within each region of this study were based on the thermokarst landscape coverages, region-specific SOC concentrations (kg C/m2), and areal coverages of different soil types. There is one shapefile (.shp) with this data set. The data are also provided in .kmz format as a companion file for viewing in Google Earth. Figure 1. Dominant or co-dominant thermokarst landscapes within the northern boreal and tundra circumpolar permafrost region (from Olefeldt et al., 2016). This study encompassed the boreal and tundra ecoregions within the northern circumpolar permafrost zones, covering 12.4% of the world land area. Areal extents of thermokarst landscapes were estimated through the spatial modelling framework that weighed the perceived relative influence of landscape characteristics, including ground ice content, sedimentary overburden thickness, permafrost zonation, terrestrial ecoregion, topographical roughness, and the presence of permafrost peat soils (histels). Weights of landscape characteristics for determining the regional coverage were decided through an expert elicitation, which included input from all co-authors as well as from members of the Permafrost Carbon Network. The thermokarst landscapes are differentiated between wetland, lake and hillslope terrain. There is one shapefile with this data set: Circumpolar_Thermokarst_Landscapes.shp (provided in the file Circumpolar_Thermokarst_Landscapes.zip). 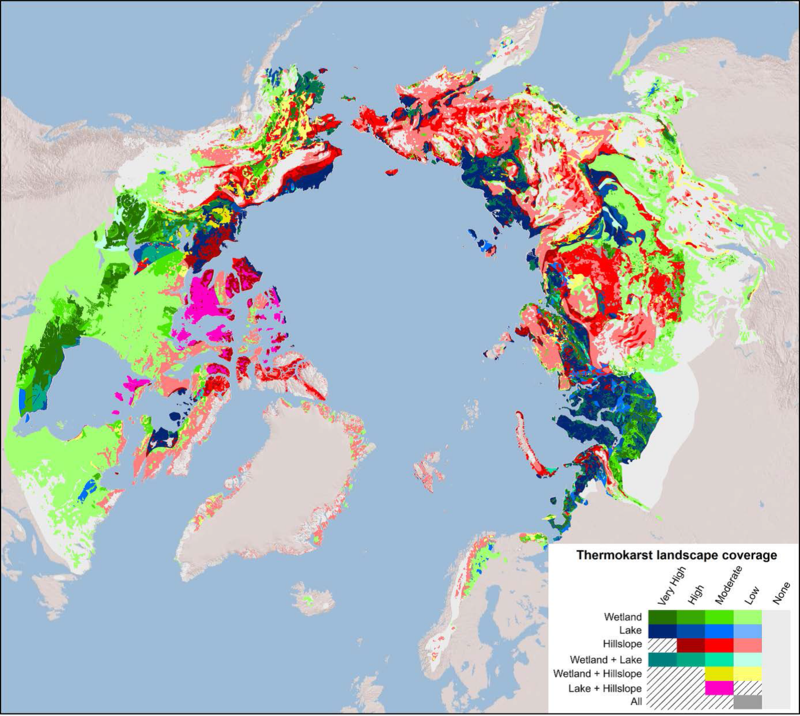 This shapefile provides the SOC and distribution of thermokarst landscapes in the circumpolar region, defined as landscapes where thermokarst landforms currently are present or could develop. When unzipped, the shapefile contains six files (*.shx, *.dbf, *.prj, *.sbn, *.sbx, and *.shp). The data are also provided in .kmz format as a companion file (Circumpolar_Thermokarst_Landscapes.kmz) for viewing in Google Earth. In preparation for archiving this data set, the ORNL DAAC performed the following data transformation. The originally provided shapefile, TK_Vulnerability_Regions.shp, with attributes TKWP, TKThLP, TKHP, was joined with the provided TK_Vulnerability_Regions.xlsx file based on the "PolygonID" field, to create the distributed Circumpolar_Thermokarst_Landscapes.shp. This joined shapefile has the original three attributes plus the additional 12 attributes from the Excel file. The additional attribute names were derived from the Excel file column names, but shortened to 10 characters as per shapefile requirements. The values in the field “TSOC_kgC” are a sum of the values in fields “WTKTSOCkgC”, “LTKTSOCkgC”, “HTKTSOCkgC”, and “NTKTSOCkgC”. Due to rounding the total might appear to be slightly off of the summation but the values in “TSOC_kgC” are nevertheless accurate. The inclusion of thermokarst in land surface and carbon cycle models has so far been in part hindered by the lack of a consistent circumpolar assessment of the distribution of thermokarst landscapes. These data provide an assessment of thermokarst distribution and carbon storage and future thermokarst distributions in the circumpolar region, and could be used in soil carbon modeling studies. Development of thermokarst landscapes through the thawing of ice-rich permafrost soils is expected to accelerate in the northern hemisphere due to ongoing climate change. This can damage infrastructure but also drastically impact landscape soil carbon storage and greenhouse gas emissions (Olefeldt et al., 2015). (1) A database of thermokarst landscape study sites (differentiating between thermokarst landscapes typical of wetland, lake and hillslope thermokarst landscapes) was compiled from published scientific literature within personal libraries and through Web of Science. Study sites were only included in the database if no other site characteristic of the same thermokarst landscape type was already located within 30 km. This exclusion of nearby sites was done to avoid over representation of a few intensely studied sites. The database included 225 study sites described in 161 studies. The number and concentrations of study sites within regions of each thermokarst landscape coverage class was calculated. The locations of these sites were compared to the corresponding mapped regional coverage of thermokarst landscapes (Olefeldt et al., 2016). (2) The second approach for map evaluation was based on a comparison between the mapped regional coverages of thermokarst landscapes and an expert assessment of regional coverages based on satellite image interpretation and general site knowledge at 435 sites. This study encompassed the boreal and tundra ecoregions within the northern circumpolar permafrost zones, covering 12.4% of the world land area. Areal extents of thermokarst landscapes were estimated through a conceptual modelling framework that weighed the perceived relative influence of landscape characteristics, including ground ice content, sedimentary overburden thickness, permafrost zonation, terrestrial ecoregion, topographical roughness, and the presence of permafrost peat soils (histels). The spatial intersection of layers containing information on landscape characteristics used in the modelling framework yielded >130,000 polygons, referred to as regions within the overall study area (Olefeldt et al., 2016). Figure 2. 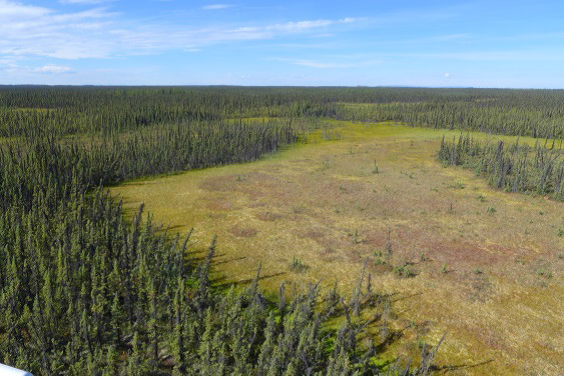 A thermokarst bog near Fort Simpson, NWT, Canada (from Olefeldt et al., 2016). 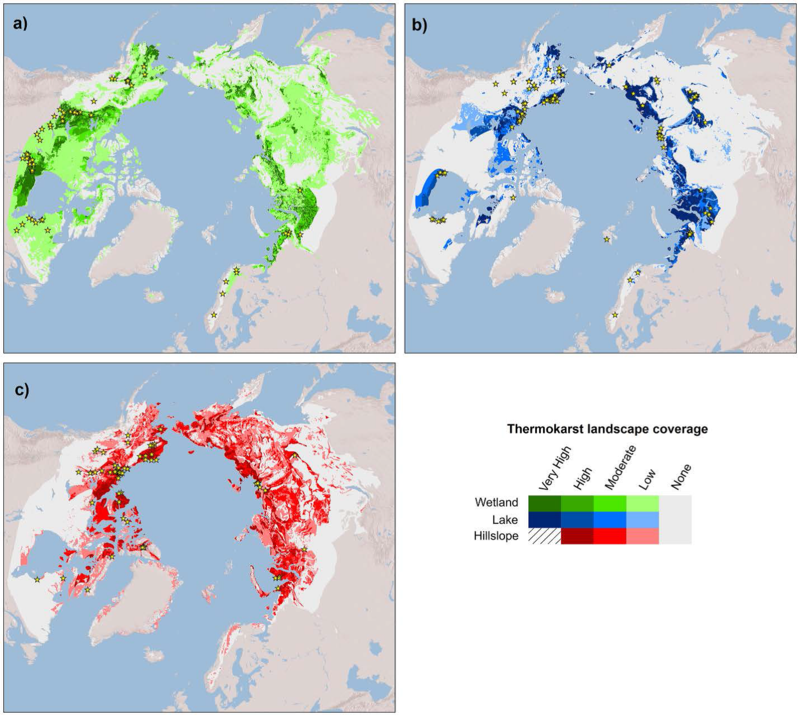 The spatial modelling framework implemented for estimating regional coverage of thermokarst landscapes was based on an expert evaluation of the relative importance of a number of landscape characteristics which included input from all co-authors as well as from members of the Permafrost Carbon Network. For this purpose, a set of six spatial circumpolar data layers were used describing key landscape characteristics; permafrost zonation (isolated, sporadic, discontinuous, or continuous), ground ice content (<10%, 10-20%, or >20%), sedimentary overburden thickness (thin or thick), terrestrial ecoregion (boreal or tundra), topographic ruggedness (flat, undulating, hilly, or mountainous/rugged), and landscape coverage of histels (<10%, 10-30%, or >30%). The spatial intersection of these layers resulted in 132,089 polygons (i.e. regions) of variable size, with 28% of regions < 1 ha and 13% >1000 ha. The largest region covered 0.3% of the overall study region. Large lakes and glaciers were excluded from the overall study region and not part of the analysis (Olefeldt et al., 2016). Figure 3. Distribution and regional coverage of TK landscapes in the northern boreal and tundra circumpolar permafrost region. Differentiation is made for a) wetland, b) lake, and c) hillslope thermokarst landscapes. Coverage is classified as Very High (60-100% regional coverage), High (30-60%), Moderate (10-30%), Low (1-10%) and None (0-1%). Hillslope thermokarst landscapes are assumed to not reach Very High regional coverage. Star symbols indicate study sites, described in literature, of thermokarst landforms characteristic of each thermokarst landscape (Olefeldt et al., 2016). The framework used a subtractive score structure, with a unique set of scores for each thermokarst landscape type (Table 1). Points were subtracted from a maximum score for landscape characteristics considered to render a region less likely to have extensive coverage of thermokarst landscapes. The resulting score was categorized into five thermokarst landscape coverage classes, ranging from None to Very High. Each coverage class corresponded to an estimated fractional coverage of a region, with both a range and a mode for each class. The mode fractional coverage was used to estimate areas of thermokarst landscapes within individual regions. Hillslope thermokarst landscapes were deemed improbable to exceed 60% regional coverage and thus the framework prevented it from attaining Very High coverage. Table 1. Framework for estimating regional coverage of thermokarst landscapes. The framework implements a structure where points are subtracted from a maximum score of 100 based on landscape characteristics, as shown in the table. The resulting score yields the coverage classes according to the ranges shown below. (e) Hillslope thermokarst landscapes are considered to not be able to reach regional Very High land cover, and thus the maximum score is 85, since at least 15 points are subtracted for the permafrost zone characteristics. (f) Regions in the southern West Siberian Lowlands were mapped as having only relict permafrost, indicating that permafrost is not affecting the surface soils, and these regions are thus considered to have None thermokarst landscape coverage. (g) Numbers indicate likely ranges and mode (in brackets) for thermokarst landscape coverage within each class. When two or all thermokarst landscapes were present in an individual region (i.e. > None coverage), then their fractional coverages were adjusted to take into account that thermokarst landscapes potentially overlap and occupy the same area. In this case, the thermokarst landscape type with the highest coverage class determined the cumulative fractional coverage of all three thermokarst landscapes. where FW is the adjusted regional coverage for wetland thermokarst landscapes that take into account co-occurrence of all thermokarst landscapes, while fW, fL, and fH are the unadjusted coverages set by the class modes for wetland, lake and hillslope thermokarst landscape coverages respectively, and fmax is the maximum of fW, fL, and fH. Solving for FL and FH (adjusted regional lake and hillslope thermokarst landscape coverages) is done analogously. Estimates of 0-3 m SOC storage for non-thermokarst landscapes and the three thermokarst landscape types within each region were based on available spatial information of 0-3 m SOC storage from Hugelius et al. (2014). This spatial information on SOC storage was scaled using on pedon data stratified both by depth (0-1 m/1-2 m/2-3 m), and by soil type. Partitioning of the total 0-3 m SOC storage within each region of this study used information of the adjusted thermokarst landscape coverages along with region-specific SOC concentrations (kg C/m2) and areal coverages of different soil types (histosols, histels, turbels, orthels, and a category of other non-permafrost soils). Wetland thermokarst landscape SOC concentration within a specific region was estimated by using the area-weighted SOC concentrations of histosols and histels within that region. Lake and hillslope thermokarst landscape SOC concentrations were both determined by the area-weighted SOC concentrations of histels, turbels and orthels. Non-thermokarst landscape SOC storage was determined by the residual SOC storage after all thermokarst landscape SOC was subtracted from the total regional SOC storage (Olefeldt et al., 2016). Hugelius, G., J. Strauss, S. Zubrzycki, J.W. Harden, E.A.G. Schuur, C-L. Ping, L. Schirrmeister, G. Grosse, G.J. Michaelson, C.D. Koven, J.A. O'Donnell, B. Elberling, U. Mishra, P. Camill, Z. Yu, J. Palmtag and P. Kuhry. Estimated stocks of circumpolar permafrost carbon with quantified uncertainty ranges and identified data gaps, Biogeosciences, 11, 6573-6593, doi:10.5194/bg-11-6573-2014 (2014). Gruber, S. Derivation and analysis of a high-resolution estimate of global permafrost zonation. The Cryosphere 6, 221-233 (2012). Olefeldt, D., S. Goswami, G. Grosse, D.J. Hayes, G. Hugelius, P. Kuhry, A.D. McGuire, V. Romanovsky, A.B.K. Sannel, E.A.G. Schuur, and M. Turetsky. Thermokarst terrain: pan-Arctic distribution and soil carbon vulnerability, 2016 (In review). Olefeldt, D., S. Goswami, G. Grosse, D.J. Hayes, G. Hugelius, P. Kuhry, A.D. McGuire, V. Romanovsky, A.B.K. Sannel, E.A.G. Schuur, and M. Turetsky. Thermokarst terrain: pan-Arctic distribution and soil carbon vulnerability , AGU Fall Conference, San Francisco, USA, 14 December 2015 - 18 December 2015. Olson, D.M. , E. Dinerstein, E.D. Wikramanayake, N.D. Burgess, George V. N. Powell, E.C. Underwood, J. A. D'amico, I. Itoua, H.E. Strand, J.C. Morrison, C.J. Loucks, T.F. Allnutt, T.H. Ricketts, Y.Kura, J.F. Lamoreux, W.W. Wettengel, P. Hedao and K.R. Kassem. Terrestrial ecoregions of the world: a new map of life on Earth. 526 Bioscience 51, 933-938 (2001). Permafrost Carbon Network, www.permafrostcarbon.org, 2016.